Mitt Romney is still pounding away at President Obama’s quote, “If you’ve got a business—you didn’t build that." Romney says it proves Obama is hostile to entrepreneurs and, to illustrate the argument, Romney has recently introduced the country to a pair of small business owners who apparently took similar umbrage at Obama's remarks. But the stories of the business owners are turning out to be a lot more complicated than Romney or even the businessmen themselves have let on. If anything, the stories seem to reinforce the point that Obama was trying to make in the first place—and the argument he has been making for his re-election. The first business owner is Brian Maloney, who operates a truck and auto body shop in Boston’s Roxbury neighborhood. During a campaign appearance with Romney on Thursday, Maloney said “I take umbrage at the suggestion that people don’t start and build businesses. … We don’t need any more of government’s help. We haven’t had any.” But that statement turns out to be a little misleading. During the 1980s, according to a story by Callum Borchers in the Boston Globe, Maloney had used a government loan to relocate his business from Cambridge to Roxbury; once in the new location, the company took on a half-million dollar contract with the federal government, quintupling its annual revenue. The other small business owner is Jack Gilchrist, owner of Glichrist Metal Fabricating in Hudson, New Hampshire. 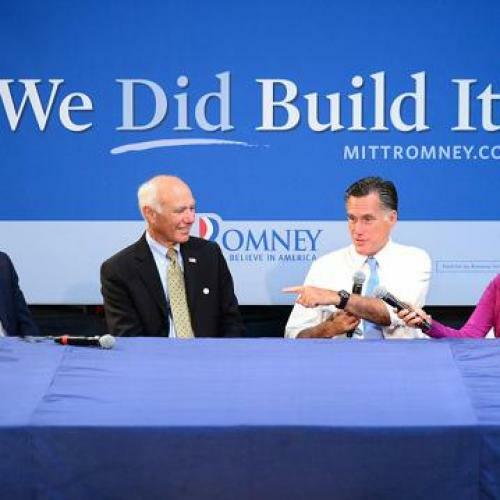 Glichrist stars in a new Romney campaign ad, saying “My father’s hands didn’t build this company? My hands didn’t build this company? My son’s hands aren’t building this company? …Through hard work and a little bit of luck, we built this business. Why are you demonizing us for it?” But it appears that Gilchrist’s business, like Maloney’s, also got some help from the government. According to John DiStaso of the New Hampshire Union-Leader, Gilchrist benefitted from a variety of loans from federal agencies and federally-funded initiatives, not to mention defense contracts that account for about one-tenth of the company’s business. It shouldn’t have taken these revelations to remind us that each owner, and each business, has benefitted from government intervention. After all, both men can make financial decisions comfortable in the knowledge that, upon reaching retirement age, they will have a pension and basic health insurance from the government, in the form of Social Security and Medicare. They also have peace of mind that, should they experience financial or physical misfortune, government will provide help in the form of unemployment insurance and disability payments, among many other programs for the poor and disabled. Does this diminish what Maloney and Gilchrist have accomplished? Hardly. Building a successful business is extraordinary difficult; both men deserve lots of credit for that. Although Romney doesn't acknowledge it, Obama said as much in the same speech where he uttered the now-infamous “you didn’t build it" line. Obama was simply saying that, in the U.S., individual effort alone is rarely sufficient for success—that those who thrive usually get some help from society and, frequently, a little good fortune, too. In theory, most conservatives don’t dispute that notion. As Romney himself said when he was appearing alongside Maloney, we need government to build roads, to protect public safety, and so on. At the rhetorical level, the argument Obama and Romney are having is the more nuanced argument that liberals and conservatives have been hashing out for ages—over the proper balance between individuals and government, and over the real impact of effort versus luck. But look more closely at what Romney actually proposes to do as president, and you'll see that he's embraced an agenda that's well outside the normal boundaries of that debate. Yes, one of the presidential candidates has a radical plan for America. But it's not Obama. The heart of Romney's agenda is a pledge to cap federal spending at 20 percent of GDP. while setting aside about a fifth of that for defense spending. I don't think the public, or even the press, yet appreciate just how profoundly that would change the shape and size of government, so here's one more stab at explaining it. According to an analysis from the Center on Budget and Policy Priorities, Romney's proposal would force overall spending to everything but defense and Social Security of either 40 or 59 percent by 2022, depending on whether Romney also insisted upon a balanced budget by that time. (See graph.) We can't know exactly which programs Romney would cut and by how much, but reductions of those magnitude would likely affect everything from biomedical research to law enforcement. A separate calculation, conducted at the request of Washington Post blogger Greg Sargent, suggested the Romney spending plan would mean $12 billion a year less to spend on teachers, police, and first responders. And don't forget: Romney has already made clear his intentions to end the federal guarantees of Medicare and Medicaid, so that they provide substantially less financial protection, cover substantially fewer people, or some combination of the two. Yes, Romney would lower taxes. But mostly that would be for the benefit of the very wealthy, of whom small business owners represent only a small portion. In short, Romney wants to weaken or eliminate many of the supports on which all Americans, including small business owners, survive. You can make a pretty strong case that, in such an environment, building a business would be much more difficult than it is today.